In Part 1 of “The Ultimate User’s Guide to Portuguese Cheese”, we covered the 2 self-created categories “A Lil’ Stinky But Smooth And Creamy and the “Not Too Soft, Not Too Hard And Not Too Stinky”. The last 2 categories highlight the “Hard, Rugged and Nutty” cheeses, as well as the “Refreshing”. However, you must be reminded that all of the cheeses covered in my article are not the only quality cheeses in Portugal; there are still hundreds of other cheeses, many very similar in style to one or more of my four categories. Also true, cheeses may vary in characteristics and descriptions depending on where you buy them. And of course, there will always be some very rare, small production cheeses that are absolutely incredible but so hard to find, or gather precise information on, that I unfortunately cannot include them in my special report. So I encourage everyone to explore online, or in-country, and spread the word as to the treasures you stumble across. To help get you experience your own Portuguese cheese tasting, I’ve provided a few places where you can order online and have Portuguese cheese shipped to your home:Portuguese Food.com, IGourmet, Marky’s and Amazon.com. These sites don’t offer large selection, so if you find more, please let us know in the comment’s section below. Please be aware that many sites that claim to have Portuguese cheese are actually Spanish, so pay attention to specific cheese names. Alright, now on to the rest of the cheese! From my careful observation, there are very few Portuguese cheeses that are predominately sold in a dry, hard aged style, but, of the few that they do, they do them very well! DOP São Jorge or “Queijo da Ilha” (Azores Islands) – The “Island Cheese” of Saint Jorge Island is the largest of the Portuguese cheeses, and the only one made exclusively from whole and raw cow’s milk. Cured and aged for 3 months then formed into large rounds of 8-12 kilos, this cheese requires a minimum of 45% milk fat; whereby, making it very rich. It’s sold in the rounds or wedges with its look being very similar to Pecorino Romano but the aroma being a lot stinkier..a mix of stinky and nutty! But like most stinky cheeses, once you get past the smell, the cheese is quite flavorful, sharp, nutty, buttery, most Azoreans like it for breakfast slapped on a piece of fresh baked bread. São Jorge is commonly produced in a picante style of varying degrees, which is very popular. But be careful, as people have been known to gain a stomach ache or break out in a rash if they consume too much! DOP Terrincho (Trás-os-Montes and Alto Douro) – Originated in the district of Bragança in the far north, this cheese is made from the raw sheep’s milk of the Churra da Terra Quente (Terrinchas) race of sheep. Cured and aged for a minimum of 30 days but commonly maxed out to 90 days to achieve the velho status, Terrincho is produced in medium-sized rounds of 800-1200 grams with an easy to spot rind of bold orange or brick red. However, when you get past the hard outer rind, the interior is surprisingly smooth and creamy while still being firm. The flavor is also very smooth, creamy and nutty and makes it one of the best cheese to be consumed with wine, one of my original favorites! This category of cheeses includes all white, uneven curd cheeses, ranging from soft to hard with most available fresh or uncured. 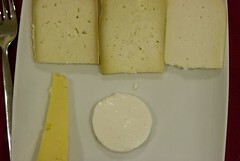 The main milk and style used is goat cheese, but many choose to mix them with sheep’s milk too. Their flavors are also predominately lighter and “fresher” in flavor than the other categories (with the exception of the last one) and are typically consumed on their own, or as an appetizer during meals or added to salads. There happens to be a very popular cheese brand here called Saloio, which produces almost the entire gamut of cheeses listed below from their Palhais production. They do not have a DOP designation, but I highly recommend their products, as I use them routinely at home. Queijo Fresco – Fresh cheese or uncured cheese, queijo fresco can be made from cow, sheep or goat’s milk and comes in whole or skim styles. Prepared similarly to fresh mozzarella but with a much lighter, melt-in-your-mouth texture, the cheese is stored and packaged in small plastic round molds of 60-100 grams filled with water. It is a basic staple in Portuguese meals and is preferably consumed as a side dish for lunch sliced thick and sprinkled with a little salt, pepper and/or olive oil or as an entrada for dinner. I personally find its naturally made with enough salt, and therefore, prefer it plain. Above all, it is always eaten very daintily with a knife and fork! Requeijão – “Recheese”, the equivalent to ricotta or cottage cheese in Portugal. It can be made from any type of milk like Queijo Fresco but it is more commonly eaten at the end of a meal mixed with something sweet or as its own dessert. Portuguese Chévre – Recently, the Portuguese have started producing some of their own French-style “Chévre” and Fines Herbs goat cheese, sold both in small cylinders and logs as well. Most of the production is done in the northern regions of Minho and Ribatejo. The flavor is just as good as the original, if not better, and of course, sells at a lower price. Another Chévre-like goat cheese, native to the Minho, is Sto. Isidro made from Alpine goat’s milk. DOP Rabaçal (Beira Litoral) – Named after the small village near Coimbra, Rabaçal is made from a mix of sheep and goat’s milk and cured for a minimum of 20 days. Produced in rounds of 300-500 grams, this cheese is often sold as semi-hard or hard but also comes fresh. The flavor is like a typical fresh or cured goat cheese with a little tartness to it. Other known nearby towns that produce good Rabaçal are Anisão and Penela. Queijo de Tomar is a cheese from Ribatejo that is produced in a similar style as Rabaçal but sold in tiny hard rounds, making it the smallest of the Portuguese cheeses. DOP Picante de Beira Baixa (Beiras) – The “Spice of Beira Baixa” is indeed one of, if not, the spiciest Portuguese cheese you can find. It’s made from raw sheep or goat’s milk or a mix of the two and produced in larger rounds of 400 grams to 1 kilo with a simple tinfoil wrapping. The color is not actually a true white, it’s more like a “dirty white” to light gray. Warning: Only for serious cheese people, because the flavor is intense! It may not seem so when you first put it in your mouth, but after about 15-20 seconds, a searing mix of black peppercorn and charcoal leaves your mouth with an immensely dry, salty aftertaste. Picante is a little too much for my taste, however if you’re a fan of salt and adding freshly ground black pepper to most of your food, then this is your kind of cheese! Don’t miss the third and final part of my Special Report, where locals, natives and overall lovers of Portuguese cheese, give their favorite wine and cheese pairings!